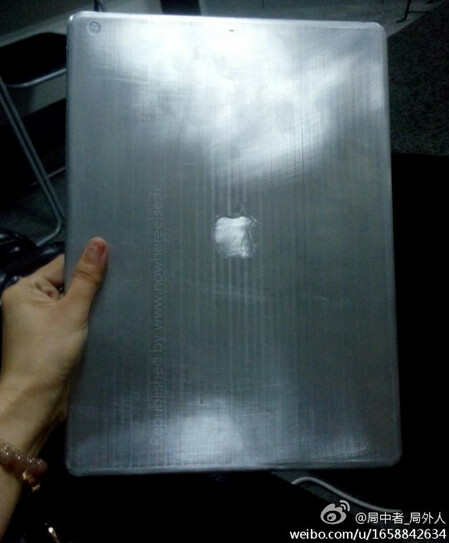 A leaked photograph out of China, shows what is allegedly a prototype of the 12.9 inch Apple iPad Pro. Late last year, there was talk about such a slate being built for the education market, as a replacement for textbooks. Later reports had Apple testing a version of the tablet with a 2K resolution screen, and one with a resolution of 4096 x 3072. The prototype is made from aluminum, displays the Apple logo in the middle and the camera lens in the corner. Of course, we suggest that you take this with a grain of salt. At this stage, a 12.9 inch iPad is far from being a sure thing. The early buzz about the 12.9 inch iPad is that it will not be made for consumers and Apple will focus on selling it in the education market and in the enterprise. In the meantime, you can take a look at the picture (use your cynical eye) below. Most of the reports we've passed along to you about the iPad Pro call for a release during the third or fourth quarter. Lol it's portrait....has to be fake. I think they'd wise up and make it landscape at that size instead of just going their regular bullheaded way (really only an idiot would use that thing portrait unless their life was on the line). The iPad is sooo lame. Nope. It is a very well rounded product with great tablet apps support. Although iOS itself needs some work on iPad. I like big tablet and I cannot lie. The resolution is great for the size, far better than Samsung's 12.2" tablet. Of course, a giant tablet without a high resolution pen, well, not so interesting. I don't think the usage models of a notebook and a tablet are the same. Some of use want to use these big tablets for viewing/editing/marking up PDF files. Having the narrow wide screen is not good for this sort of task. Or any document-centric task where you want to use the entire screen for clear document display. Also, even in landscape mode, a 4:3 tablet is going to give you more vertical real estate than a 16:9 tablet. And for many things, being able to see more of the page vs. having to scroll is quite useful. Not that far when we see Apple making 20 Inch tablets and people applauding for them..Sigh.. iOS on that scale would be useless. A mac with a digitizer would be interesting though. That looks like a metal cutting board. Replacement for books? You can buy a small library for the price that will probably go for(and the replacements for when its stolen/dropped).